Here is an Iconic Pet product that makes pet travel attractive. The Zoompet beatles carrier gets its name from the all timefavorite Beatles car model. The Beatles Carrier is so well designed for the comfort and convenience of your pet as well as your handling that it takes away your worry of pet transportation during travel. 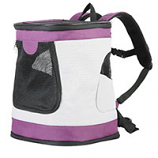 The compact pet carrier gives it a cute attractiveness that matches the personality of your pet. This is a stylish addition to your baggage wherever you travel. Apart from the style the Zoompet Beatles Pet Carrier is absolutely safe and spacious enough for the pet to travel in comfort, whether in a car or on an airplane. A comfortable and cozy pet carrier is vital to retrain pets for ensuring safe rides and any kind of travel with your pooches tagged along. Comfortable and Stylish Pet Front Carrier for Dogs and Cats adds as the perfect fashion accessory for you at an affordable price. This pet front carrier for pooches is designed with a top opening and a drawstring to keep the pet cozy, relaxed and warm. Now commuting with your pet will no longer be a hassle. Cozy One-Side Expandable Pet Travel Bag acts as the perfect containment unit for cats and dogs up to 20 lbs. You can now carry pets from one place to another in much style due to this bags contemporary design and vibrant lime green hue, accompanied with a navy blue color. Now, taking your four-legged beauty from one place to another will never again be a bothersome issue. 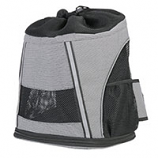 Cozy Ventilated Two-Sided Expandable Pet Travel Bag goes about as the ideal control unit for cats and dogs to be confined, in order to be carried from one place to the another. It has a high-quality top and front see-through mesh, ensuring that your pet gets enough air and light. Snuggly Aerated Foldable Luxury Pet Backpack for Dogs and Cats presents you with a stylish opportunity to invite your pet along, onto long hikes, off-road adventures, and other indoor and outdoor travels they don’t have the stamina (or leg-length!) to go along. For nervous pooches, Snuggly Aerated Foldable Luxury Pet Backpack for Dogs and Cats can provide an extra layer of security in crowded or unfamiliar spaces due to its leash clip, specially meant to attach to your pet’s collar for added safety. Your four legged companions are so much more than just a simple pet, they are family! Therefore once you are on the go, it is important to make sure they keep safe. For those times to carry your pet, the FurryGo Adjustable Luxury Pet Car Booster Seat can be used as shoulder carrier and within the vehicle, it works as a booster seat. With your pet being comfortably secured, you will feel satisfied when you are on the go. There is something for every pet owner who loves to travel around with their pets. Attaches easily to most vehicle seats. The removable and washable fleece cover makes it easy to maintain. It also comes with a zipper pocket in the front to hold essentials. FurryGo Adjustable Luxury Pet Car Booster Seat is made of 600D oxford fabric and Sherpa lining and is recommended for pets up to 13lbs. The FurryGo Adjustable Luxury Pet Car Booster Seat has been manufactured by Iconic Pet, creator of high-quality products. The FurryGo Hammock Pet Car Cover is an anti-slip mesh hammock system seat cover, 56” x 56” is ideal for your much loved pet. Made from durable high quality Oxford fabric, keep your back seat as good as new. Fits all cars and SUV with adjustable straps and Velcro bands. The FurryGo Hammock Pet Car Cover is a wonderful choice for shielding your vehicle seats from pet hair, dirt and dust and other alternative potential damaging materials. It can be easily be maintained and is water resistant. The Hammock Pet Car Seat Cover is ideal while your traveling with your pets. It give them enough room to play around and be comfortable. The Hammock seat cover can easily be folded and put away when not in use. The FurryGo Hammock Pet Car Cover has been manufactured by Iconic Pet, creator of high-quality products. FurryGo Luxury Pet Booster Seat perfectly performs as pet bag and car seat. With Luxury Pet Booster Seat you can put your mind is at ease while driving in conjunction along with your pet. Attached in seconds to the rear seat of most vehicles, our Luxury Pet Booster Seat keeps dogs safe and secured with an enclosed limitation that is attached to your dog's collar, the Booster Dog Seat also protects and secures your pups from even the most strenuous potholes. Your paw-friends travel in the most fashionable way. The effortless yet fashionable Pet Booster Seat features pockets on three sides for storage of essential products and the Booster Seat can also be easily folded flat for storage when not in use. The Luxury Pet Booster Seat is made of 600 Denier Nylon shell, it is also extra softly padded and it can also be easily maintained. Luxury Pet Booster Seat is recommended for pets up 13 lbs for small size carrier and up to 18 lbs for large size carrier. The FurryGo Luxury Pet Booster Seat has been manufactured by Iconic Pet, creator of high-quality products. The FurryGo Pet Cargo Cover makes it easy to travel with your pets in any weather. Help protect your vehicles from pet hair, dirt, drools and dust any time of year. It is adjustable and fits any Van/SUV cargo area. The velcro-like adhesive keeps the cargo cover in place and helps your four legged companion to move around in the confined space with ease. Pet Cargo Cover is water resistant, very easy to maintain and is machine washable. The FurryGo Pet Cargo Cover for Van/SUV has been manufactured by Iconic Pet, creator of high-quality products.